The Golden Retriever is considered one of the best races of a company for the disabled and the blind seeing-eye because of their intelligence and loyalty to his owner. It is a breed particularly friendly and affectionate dog, this is not the aggressive dog, what makes the Golden Retriever the ideal dog for a family. His gaze is tender and melancholy, they need love from the people around him. The Golden Retriever dogs are very attached to their owners, they love kids, play and go for a walk and do their daily exercise. And do not talk about the beauty of this race … that is impressive highlighting her golden hair color. In short, we can say that is the ideal pet for families every lover of dogs. Friendly, intelligent, sweet, playful, reliable, and devoid of aggressiveness, you can observe for hours with a look between melancholy and tender with only we will be asking for affection and love. He prefers human contact to run for hours in a lonely garden. This makes it, despite its size, in a very good company for apartment dwellers. However, being extremely versatile, it is the admiration of young and old at the time of a walk. Extremely docile with children, let them play with it endlessly. It supports calmly pulling hair, ears, and tail. Being a race that once brought the hunter his prey, it becomes fun assured if we have water near room temperature and permits. You can dive into the river, sea, lake or pool, recovering thrown into the water and bringing them to our feet, in exchange for a caress as a reward objects. With a life expectancy of between 13 and 15 years, the only vaccination required to maintain its day, and the occasional trip to the vet. Weighs between 27 and 36 kg and reaches a height of between 40 and 56 cm, with the largest male than the female. Their daily nutritional requirements vary between 1,460 and 1,750 calories, covered perfectly with any balanced food according to their size and age. It requires many daily cares rather than some rides for your needs. Brushing weekly, we can help you shed hairs go moving as well as avoiding undesirable clumps of lint in the corners, so keep your healthy and shiny coat. 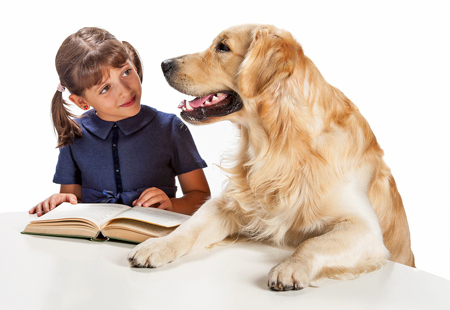 Therefore, incorporating a Golden Retriever family is undoubtedly is an excellent choice for the parents, who will remain absolutely quiet when their little ones have fun under the watchful eyes of your pet.